Merakii Art House by Chandni Gulati has organised another group art exhibition titled "EPIPHANY" . All the promising future artists are given an opportunity to enhance and showcase their talent to the mass.This will give them opportunity to present themselves and also learn a lot from the fellow artists...The artists are from different states and have their unique styles of portrayal through art. the word epiphany means, manifestation, sudden revealation or realisation. This group show is dedicated towards the unique portrayal of thoughts in different styles, techniques, colour or mediums by different artists. There may be a moment of epiphany that is , a sudden realisation or thought of painting in the way the artist wants to which is unique to its own self. the beauty is that everyone has their own ways of portrayal- which is also the theme of the show - MY SOUL THROUGH MY PALLETTE . Every artist has their soul in the artworks they create. Our theme is about the reflection of the artists who create art reflicting their ideas and thoughts into their canvases. About the Organization : The idea behind these art shows is to create opportunity for all the young artists and art lovers who want to bring their work in front of the world and make a name in the Art market. Chandni believes that every new idea, technique and vision portrayed through art should be brought out to the world and appreciated. 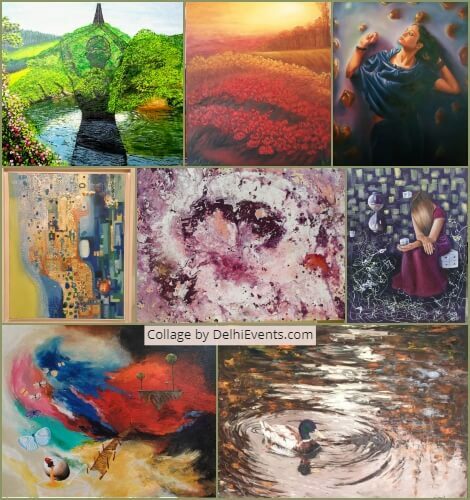 The Group of artists come from different states and have their own unique styles of portrayal through art, be it photography, painting or sculptures.